Multiple users can develop forms personalization at any given point in time. 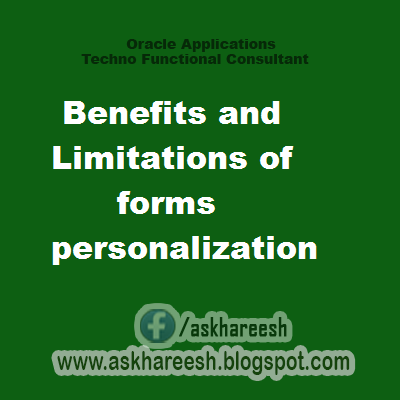 It is fairly easy to enable and disable forms personalizations. A programmer is not required to do simple things such as hide/disable fields or buttons. Provides more visibility on customizations to the screen. Can't create record group queries, hence can't implement LOV Query changes. So can't have a message box that gives multiple choices .